Available through Coffee House Press, Amazon.com, Alibris and AbeBooks. U Sam Oeur, whom I’ve never met, springs to life in the pages of this full-blown, inspiring memoir. He is an accomplished poet and a born writer. He has absorbed enough experience for several lifetimes. As a Cambodian who survived the Khmer Rouge years, he is lucky to be alive at all. He was born on a farm in Svay Rieng province in eastern Cambodia in 1936. As he tended his father’s water buffaloes in the closing years of French colonialism, he could never have foreseen what lay ahead for him or for his country. Luckily, his father was prosperous enough to send him to school. Sam Oeur’s abilities as a student took him to Phnom Penh, where he completed high school (as very few Cambodians did; there were only a handful of high schools in the country) and studied industrial design. In 1961, the US government, as part of its aid program to Cambodia, awarded him a scholarship to study in the United States. Sam Oeur was engaged to be married just before he left; neither he nor his fiancée Yan imagined that he would be gone for seven years. Sam Oeur’s encounter with America in the 1960s was bewildering at first, but confusion soon deepened into love. He criss-crossed the country, and as part of his English-language training he memorized the Gettysburg Address, parts of the Declaration of Independence and hundreds of lines of his favorite poet, Walt Whitman, After he earned a degree in industrial design in California his own talents as a poet came to the attention of Dr. Mary Gray, an almost legendary figure in the Asia Foundation at that time. Dr.Gray recommended him for a scholarship at the prestigious Writers’ Workshop at the University of Iowa, where he earned an MFA and met several other writers, like Ken McCullough, who became his friend for life. By 1968 Sam Oeur was anxious to come home. His fiancée, almost unbelievably, had waited for him for seven years—they married shortly after his return. In the closing years of Prince Sihanouk’s one-man rule in Cambodia, Sam Oeur avoided politics. He chose, instead, to start a family while he managed a fish cannery, very competently, in the remote western province of Koh Kong. In April l975, the Khmer Rouge swept into Phnom Penh and drove its two million people, including Sam Oeur and his family, into the countryside. Sam Oeur, an adroit survivor, shepherded his family toward the northeast of the country, where they endured over three years of hardship, including the tragic deaths, at birth, of his twin daughters, at the hands of a midwife who was under orders to kill all newborns. For over three years U Sam Oeur kept his head down, concealed his background and relied on reawakened peasant know-how to withstand the rigors of the regime. When he was alone, he lifted his spirits by reciting Walt Whitman’s poems and John F. Kennedy’s inaugural address. His immediate family also survived, he tells us, because an array of guardian spirits was always there to help them. But after the fall of the regime, in 1979, he discovered that twenty-three members of family, including his parents, two sisters, three brothers, and fifteen nephews and nieces had been killed or died of overwork and starvation in the Khmer Rouge period. In 1978, the Khmer Rouge regime foolhardily declared war on Vietnam. When Vietnamese armies invaded Cambodia at the end of the year, the country broke open like an egg. The Vietnamese soon established a friendly Cambodian government in Phnom Penh, The Peoples’ Republic of Kampuchea (PRK), and stationed over 200,000 troops in the country. Cambodia was dependent on Vietnam until l990, when the collapse of the Soviet Union, and the end of Soviet assistance, forced the Vietnamese to withdraw their forces. The PRK officials remained in place, but quickly ditched Marxism-Leninism as an ideology. Sam Oeur’s description of his life in the 1980s is in many ways the high point of the book. 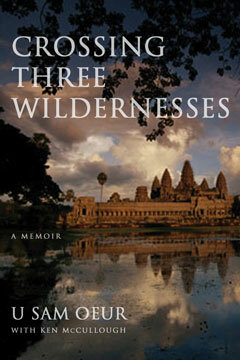 After a few months of scavenging in the skeletal city of Phnom Penh, Sam Oeur found some work in the Ministry of Foreign Affairs, and later was put in charge of a bicycle factory before rising inside the PRK’s ministry of industry—probably the first and last Cambodian poet to climb as far in such surroundings. He gives vivid glimpses of a decade when, as he tells us, he “hoped to stay alive and to serve [his] country.” Having done both, he lost his government job in 1990, in part for writing some subversive poems. For a few months, vividly described, Sam Oeur drifted into alcoholism at the margins of society. At a time when readers might assume that he was losing his mind, his guardian spirits were working overtime. In 1991, his luck changed (yet again) when he was hired by the newly established US diplomatic mission on an informal basis, to gather intelligence for the ambassador. Not long afterwards, Sam Oeur’s literary friends from his Iowa City days obtained a new fellowship for him at the University of Iowa, supposedly for three months. Sam Oeur has remained in America ever since. Crossing Three Wildernesses closes, aside from a brief epilogue, at the airport in Cedar Rapids, where Sam Oeur is met by his friend Ken McCullough, picking up threads that had been dropped nearly a quarter century before. It’s an honor for me to introduce a book that has taught me so much and has given me so much pleasure. Newcomers to Cambodia’s history will find themselves in the hands of an alert, courageous, sensitive participant and witness. Old Cambodia hands will delight, as I did, in the refreshing insights and new information that Sam Oeur imparts. 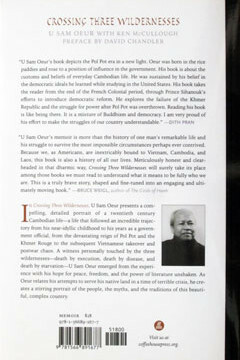 But the book is more than the story of one man’s entanglement with history, It is a moving and persuasive account of a tumultuous life that has taken U Sam Oeur from the rice fields of Svay Rieng, to America and back again, coming to bask at last, in the pleasures of being a grandfather, here represented at the height of his powers, perhaps as his guardian spirits had always intended.